Washburn has reorganized its Heritage line, splitting it into the 10, 20, 30 and 40 series based on the choice of back and side woods. The Tree of Life guitar manufactured this year by PRS’ luthiers is based on an Angelus acoustic model. Martin & Co celebrates several anniversaries and special events this year, with three limited edition guitars that debuted at Summer NAMM. Recording King will introduce tomorrow at Summer NAMM 2014 its first guitar that uses torrefied wood. We took this new, inexpensive dreadnaught from Yamaha for a test drive. Here's what we found. 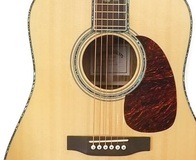 The Winter NAMM Show 2014 saw the launch of no less than 16 new six- and 12-string L Series acoustic guitars. Lâg Guitars introduces to the US market the T80 and T80DCE guitars at the NAMM Show 2014. Lâg Guitars launches at NAMM 2014 the Tramontane 500 Series acoustic guitars in the U.S.
Norman adds a new entry level guitar series to its catalog, named Expedition and featuring three instruments.